Members of the FortCollinsTrailRunners pose with race champion Matt Carpenter after the awards ceremony. Clockwise from top left: Frank Antonelli, Jonathan Vigh, Matt Carpenter, Eric Sigler, Cherilyn Sackal, Chris Denne, Steve Saleeby, Mike Smith, and Dan Turk. 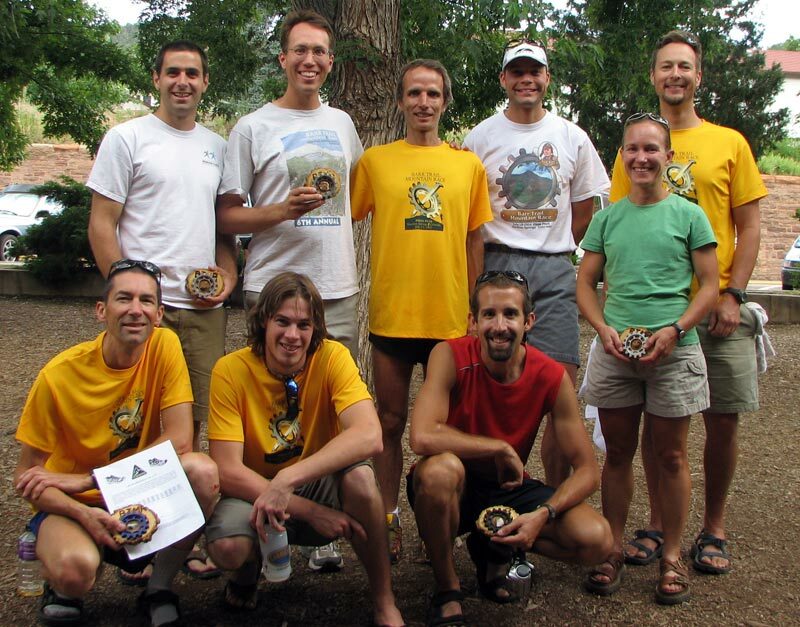 Here's my article on the overall 20007 Barr Trail Mountain Race (I have also written a personal race report). This was the 8th running of the race, which was started in 2000. The course starts at the Cog Railway (El. 6600 feet), climbs 3600 feet in 6 miles up the Barr Trail to Barr Camp (El. 10,200 feet), then turns around and comes right back down, ending with a sadistic hill climb up to the finish line. This has become one of the most competitive trail races of its class and length in the Rocky Mountain region and is a great race all around. I like to say "half the distance as Pikes, but twice the fun". First off, the overall big news of the day – Matt Carpenter amazed us again! While he has reigned as champion in 5 out of the past 7 years by consistently posting winning times of 1:30 to 1:31, this year he pulled a surprise out of the bag. At the age of 42, he bested his own course record of 1:30:07, set back in 2001 when he was 36 years old. His new time? 1:29:33! Ryan Hafer (age 21), of Colorado Springs also posted an amazing time of 1:30:47. Simon Gutierrez (age 41) took third overall with a time of 1:35:41 – nearly 5 min slower than 2nd place. Just to put these times into perspective – before today, this course had been run in less than 1:31 on only 3 occasions – Matt's record breaking time in 2001, Paul Low's 1:30:55 win in 2003, and Matt's 1:30:53 win last year. To have 2 runners go under 1:31 in the same race is a pretty amazing occurrence. (In several years, the winning margin has been 3 or 4 minutes). The race splits have not been released yet, but I talked to Matt after the race and he said his uphill split was 55 min. Based on how Matt and Ryan have run in previous years, Ryan was probably a couple minutes off of that, so Ryan may have been catching up to Matt on the downhill – it must have been quite the race for both of them! I'm not sure if Ryan was ever close enough to see Matt on the downhill, but regardless, having some competition like this probably encouraged both runners to post their best possible times today. They were both flying when they went by me (I was about 4.7-4.9 miles up, and they were already at mile 7 coming down!). In the women's race, Lisa Goldsmith (age 41) won overall with a time of 1:52:16. Katie Blackett (age 30), who had won the two previous years, was less than two minutes back, coming in second with 1:54:03. Susan Nuznum (age 40), of Boulder came in third with 2:04:32. I'm not sure of all the stories on the women's side of the race, but I'm sure there must have been some interesting details as well. I was running in amongst the top women - the top 2 were well ahead of me, but I traded places with many of the other age-group winning women during the race – unfortunately, there was not a lot of excess oxygen to use for conversational purposes. Okay, so how did the FortCollinsTrailRunners do? There were 338 finishers and approximately 75 age group awards given out - so the average incidence of awards was 1 age group award for every 4.5 runners (which is in itself pretty nice – awards went 5 deep in age groups with at least 20 runners – by the way, the age group awards do not skim out the overall winners, so these are "true" positions). So given that we had 9 runners, we should have gotten 2 awards if we were "average". We aren't a team, with sponsorships and all (like the GoLite team, and we aren't a club (like the 863-member Incline Club) – we're just a YahooGroup of friendly people who like to run J But we took 5 age group awards! More than half our runners got awards – so I'd say that we didn't do too shabby ourselves! There are many reasons why this race is so great, but one of them is the excellence and dedication of the race organizers who have combined their vision and passion for this race to produce a fantastic end result. This is a true community event, with 100% of all race entry fees donated to local high school running programs, the Friends of the Peak organization, and the El Paso County Search and Rescue. Each selected high schools sends a “team” to man an aid station along the course – the teams compete for best “theme” - this year’s themes ranged from Smurfland replete with completely blue-skinned aid station volunteers, to the Olympic Togas at the finish line handing out delectable popsicles and misting any runners who so desired. After the race, runners vote for the best-themed aid station, which gets the largest donation. The race expenses, prize moneys, free pair of shoes for all age group winners, great food (watermelon and pizza! ), porta-potties, etc. are completely covered by a long list of sponsors. And there were free massages! So I can’t say enough good things about this race – I can’t wait until next year. Will Ryan Hafer give Matt a run for his money and become the new king of the mountain? Or will Matt pull another surprise out of the bag? Who can say? But whatever happens, it will be a blast for all who show up! Cherilyn did very well taking 3rd in her age group – I was running with her for a while on the W’s – she was running very strong. Steve and Dan were both amazing (Dan won his age group and a free pair of La Sportiva shoes). Frank did great as well, especially considering that this was his first trail race! If I had known that was him only 10 seconds ahead of me, I might have pushed a bit harder at the end J But he took 4th and I took 5th in our age group. The others also posted very good times – no one was slacking from Fort Collins (the average male overall race time is about two and half hours). Congrats to all of our runners – you were all awesome today! By the way, 9 of our group raced out of the approximately 100 who get e-mail on the list, so I believe this makes today our largest group run of the year so far (I think the record is 11 from a run a year or two ago). Anyway, this was a fantastic race – lots of fun, well organized, great competition, and a beautiful setting. If you didn’t run it this year, you should consider running next year – registration will be May 1 and will probably fill in a few days or weeks. Copyright © 2007 Jonathan Vigh. All rights reserved.